One of the great joys of visiting Todos Santos is the opportunity to see whales swimming, breaching and spy-hopping along the shores each winter. We see two main whale species in Todos Santos, the gray and the humpback. The Gray Whale (Eschrichtius robustus) is one of the most famous Mexican-Americans wintering in Baja, and sightings are frequent from late January to mid-March. This gentle mariner arrives in Baja each year around mid-January to breed and give birth in the sheltered lagoons of the peninsula. It then returns to its feeding grounds in Alaska in March; this is a 12,000 mile roundtrip that takes 2 to 3 months of swimming in each direction – with babies in tow on the return. The first grey whales to arrive in Baja each winter are usually females that are 11 to 12 months pregnant and definitely ready to give birth. Once they arrive, the babies consume 50 to 80 pounds of mother’s milk per day! Most gray whales live 50 to 60 years, and grow to about 12 meters / 39 feet, and weigh between 20 and 40 tons. 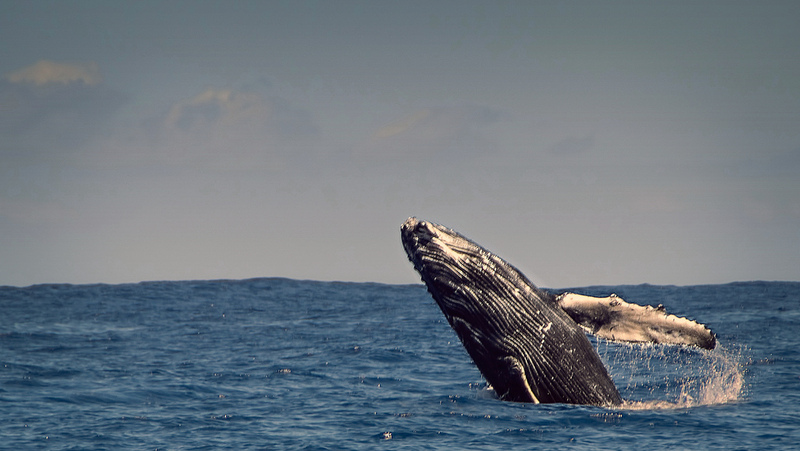 Humpback Whales (Megaptera novaeangliae) are some of the most acrobatic members of the whale community, which makes them a great deal of fun to watch during your visit in Todos Santos. It is not unusual to see several humpbacks breaching – leaping out of the water – and plunging down with the full force of their 79,000 pounds! Humpback males also enjoy engaging in displays of tail smacking, most likely in an effort to impress nearby females (and because it’s fun!). Humpback males are also known as the singers of the ocean, with a very distinctive and beautiful song that can last for 10 to 20 minutes, and be repeated for hours. Humpbacks can usually be seen off the shores of Todos Santos from October thru January, then again in April. The humpback gets its name from its distinctive body shape. It has a bulky head with bumpy knots (tubercles) and long pectoral fins. Like the gray whale, the humpback is a baleen (filter feeder) whale that grows to about 12 to 16 meters / 39 to 52 feet.